Parts of Bihar and West Bengal have been hit by communal violence over the past four days, killing three persons and injuring over a hundred. 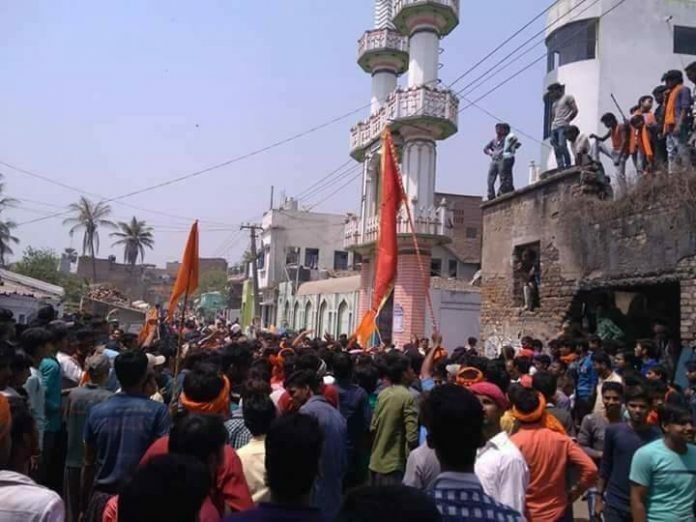 The violence began in West Bengal’s Purulia district on Sunday March 24, when local Hindu Right wing groups took out armed processions across the city on the occasion of Ram Navami. This was in violation of the administrations orders that arms were not to be carried during the processions. Despite this, the organisers not only went ahead with the processions but also made it a point to go through Muslim dominated areas in Purulia. On 26th similar incident happened in Raniganj, Asansol district. BJP Union Minister and Member of Parliament of Asansol Babul Supriyo was scheduled to be part of the central Aakhara which along with different Aakhara committees had organised this procession. Another similar procession was carried out in West Bengal’s Siliguri as well. In Kolkata, BJP workers reportedly attacked a police officer who tried to prevent them from taking out an armed procession. In the rioting 8-10 shops belonging to Muslim business owners were burnt. This included Taj Shoes, Haq General Stores and a prominent crockery store. The rioting also extended to a government run haat where mostly muslim vendors sold fresh produce. In Bihar, the violence began with a minor clash in Siwan on Sunday but by Monday, the clashes had intensified and spread toAurangabad and then to Munger and Samastipur districts. Minor clashes also took place in Kaimur and Gaya. Even in Bihar, there have been reports of violence after Hindu Right Wing outfits taking out armed processions through Muslim neighbourhoods during the immersion of Chaiti Durga. In many cases, the processions were in violation of the orders from the local administration. Like West Bengal, there are reports of provocative, anti-Muslim songs being played in the processions in Bihar as well. For instance in Munger, the procession was taken out through muslim majority areas like Kaali Tazia Dilawarpur, Mir Ghyas Chowk and Topkhana Bazaar. But also through mixed commercial areas like Neelam Chowk and Bata Chowk. Same provocative songsmentioned above were played in Munger as well. Locals in Munger also said that rumours of armed processions had dominated the governmental civil lines area during the day on the 27th, yet police and other local authorities took no step to stop this armed assembly, clearly intended to disrupt public order. In Bihar’s Aurangabad district, processions were taken through Muslim neigbourhoods despite the administration imposing Section 144 in these areas. In the ensuing rioting around 30 shops belonging to Muslim business owners were gutted and a local Muslim ambulance driver, Naeem, was shot in police firing. He is admitted at PMCH Patna. Earlier, on March 17, there was communal violence in Bihar’s Bhagalpur district after Arijit Shashwat son of Union Minister Ashwini Kumar Choubey took out an armed rally shouting provocative slogans through multiple Muslim neighbourhoods. In 2017, there were 85 incidents of communal violence in Bihar that left three persons dead and 321 injured, while in West Bengal, there were 58 incidents that left nine persons dead and 230 injured. One emerging feature of this current polarisation has been Hindu right wing groups are taking armed processions with guns, swords and bombs through Muslim neighbourhoods, playing songs and shouting slogans which are anti-Muslim or provocative. A similar trend was noted in the case of the violence in Kasganj in Uttar Pradesh earlier this year. The pattern of taking out armed processions intended to provoke through areas populated by minorities, feed into the ever increasing politics of fear and hate. Regarding the media coverage of the violence, it must be noted that the media has chosen to focus on the reaction of the minority community to the processions rather than the aggression of these processions, and the provocative songs and slogans there.Responsible media coverage is imperative if dignity, life and property are to be safeguarded. The spread of violence in Bihar and West Bengal since the Bhagalpur incident is worrisome. Citizens Against Hate (CAH), a collective of concerned citizens, said that these acts of violence are targeting minorities and creating an environment of terror. Such communal polarisation goes against the ethos of the nation and swift action should be taken by authorities to stop further spread of violence and hold the guilty to account. Besides demanding help from government, for victims of the violence, CAH also demanded that both Bihar and West Bengal authorities order judicial enquiries, to identify the culprits and understand the failures of state authorities that led to such largescale violence in the first place.